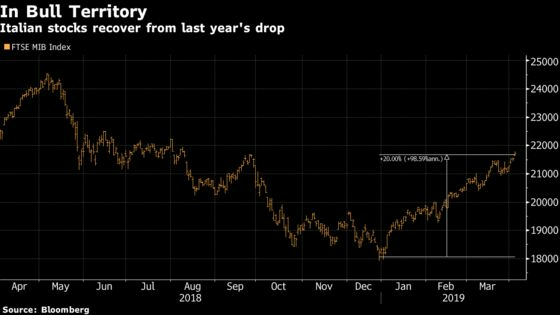 (Bloomberg) -- Italian stocks extended their 2019 rally on Wednesday, with the FTSE MIB benchmark entering a bull market, boosted by better-than-expected economic data. The index, which rose 1.1 percent on the session, has gained 20 percent since reaching a two-year low on Dec. 27 in a broad-based advance led by stocks including Ferrari NV and UniCredit SpA. March’s composite PMI data for the country showed a bigger increase than economists had expected, easing concerns of a prolonged recession. Renewed hopes over global trade also helped investors shrug off worries about the country’s fractious populist government. A tightening spread between Italian 10-year bonds and their German equivalents, no downgrade by Fitch Ratings in February and expectations of a coalition break-up leading to a more market-friendly administration contributed to the positive performance, IG Markets strategist Vincenzo Longo said. The rightist League and the anti-establishment Five Star Movement have been locked in near-constant wrangling over policies ranging from an Alpine rail link project to immigration, tax policy and security, with the League gaining ground in recent local elections and in polls at the expenses of their coalition partners. The FTSE MIB had entered a bear market in October after falling since the League and the Five Star Movement started talks to form a government in May, and fell further during the budget showdown with the European Union. Some analysts note that the current positive mood may not last, with the upcoming European elections potentially having significant implications for the political outlook in Italy, and thus for investors. “Italian politics remain worrisome and the fiscal situation is fragile,” Emmanuel Cau, head of European equity strategy at Barclays Plc, wrote in a note on Wednesday, recommending an overweight position in Spanish stocks relative to Italian stocks, and saying Spanish fundamentals are healthier.